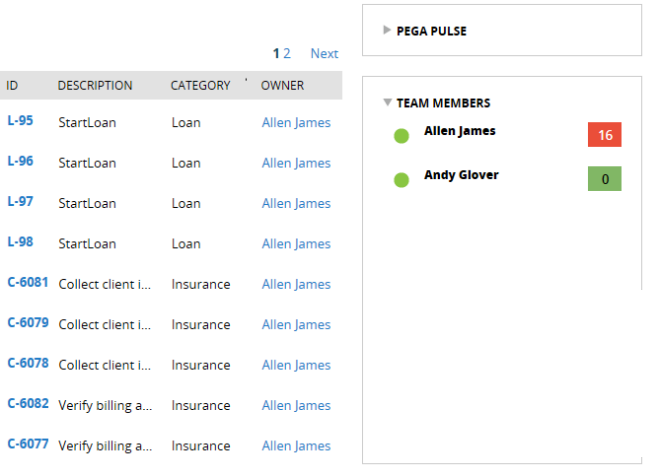 Managers can use the Bulk Process Work tool in the Case Manager portal to perform, in a single step, local or flow actions on a group of assignments or cases. A manager first creates a list of items that match a set of criteria such as case type, operator ID, work status, urgency, and so on. The manager then chooses the items they want to process. Finally, they select an action that can be performed on the selected items. For example, a manager can transfer case ownership within a specified case type in order to balance workloads; or they can adjust deadline dates on assignments for operators who will be on vacation and are unavailable. The manager also has the option to perform the actions in background mode by sending the work to an agent so that they can resume other work rather than wait for bulk processing to complete. 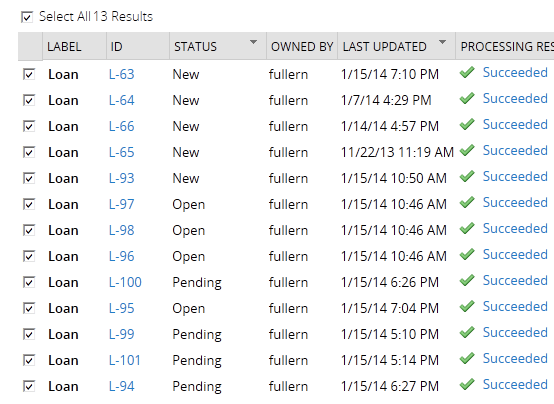 This article provides an example that demonstrates how to use the Bulk Process Work tool, and information about background processing. 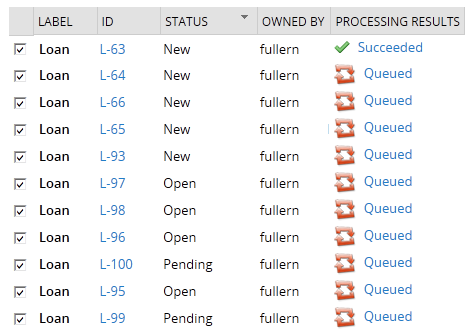 This article shows you how to use the Bulk Actions feature for 7.1. 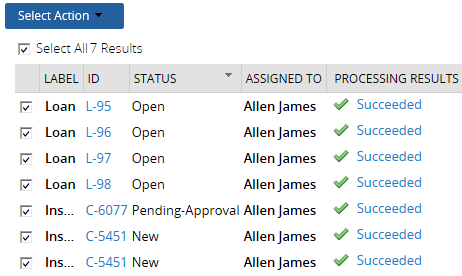 For bulk processing in 6.1 see How to perform bulk processing on a large number of assignments 6.1. 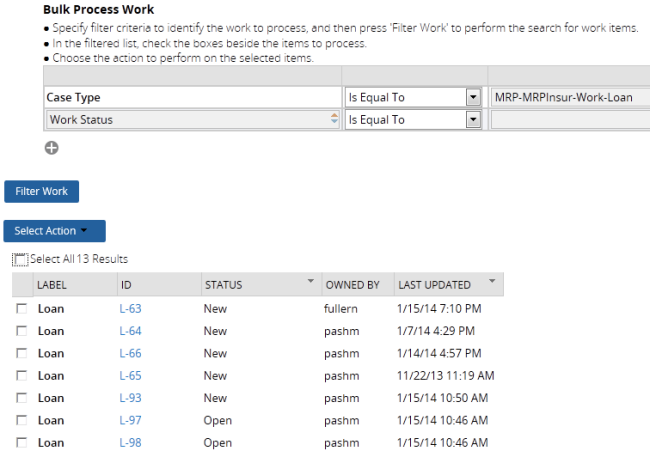 For bulk processing in 5.4, see How to perform bulk processng on a large number of assignments. A customer service representative named James Allen is taking a 10 day leave from his position at a financial services company. He works on items in two case types: Insurance and Loans. His manager, Nancy Fuller, will review his worklist and identify the high urgency items that must be be addressed during James' absence. She will transfer the work to another representative, Andy Glover, who has no items on his list. She will then lower each item's urgency by 10 to reflect the reassignment to the new operator. Set up the Update Work Object Urgency local action in all of the application's case types in Designer Studio. 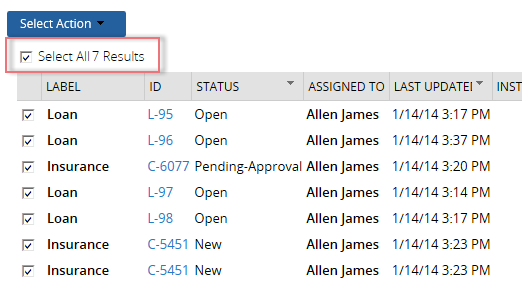 In the Case Manager portal, open the Bulk Process Tool to retrieve the worklist and filters it for items that have an urgency equal to or greater than 30. Transfer the items and reduce their urgency values by 10. 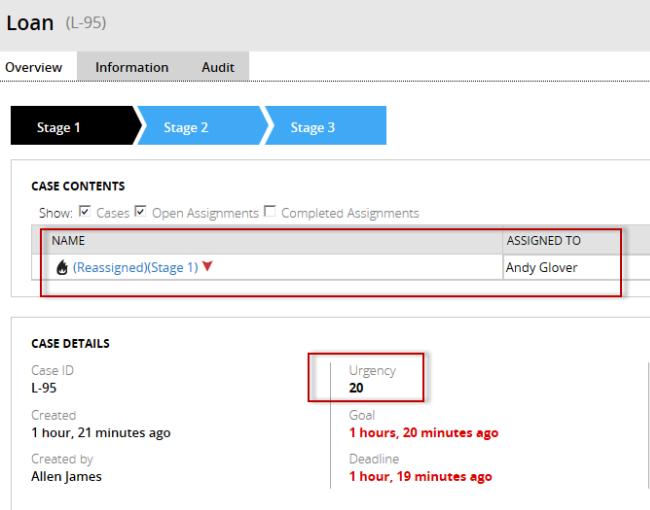 Before the manager begins, enable the Update Work Object Urgency local action for all case types in the application. 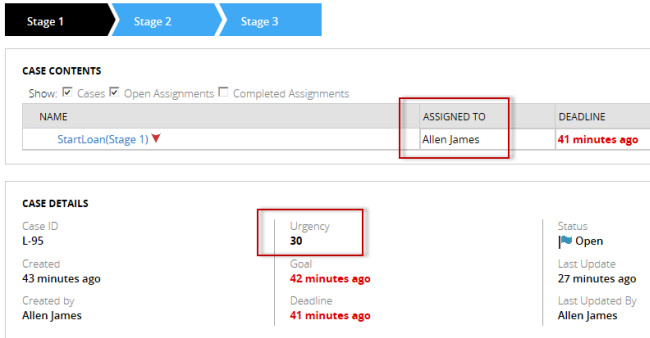 This allows the manager to update item urgency in the Bulk Process tool. Open the Case Designer landing page. Select the case type and open the Details tab. In the Case-wide local actions row, click the Edit link. In the Case Wide Local Actions dialog, add local action UrgencyUpdate. Click the OK button to save the setting and close the dialog. Nancy first retrieves a list of the Allen's work items, then creates a subset containing assignments with an urgency greater than 30. Nancy starts the Work Manager Portal. She opens Allen James' worklist, which contains 16 items. Note that Andy Glover, an available operator in the work group, has no items. 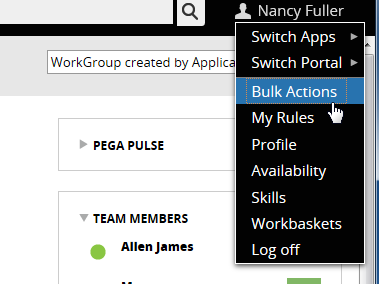 In the portal header, Nancy opens the Operator menu, then selects Bulk Actions. This displays the Bulk Process Work tool. By default, there are three rows: Case Type, Assigned to Operator (the current operator's ID is entered by default), and Work Status. Nancy next changes the operator to Allen James, then clicks the Filter Work button. This displays all of Allen's 16 assignments. Nancy adds a row to the list by clicking the add row icon . She selects the Urgency property in the first column, Is Greater Than Or Equal To in the second column, and enters 30 in the third column. She then clicks the Filter Work button. This produces a subset of seven items. 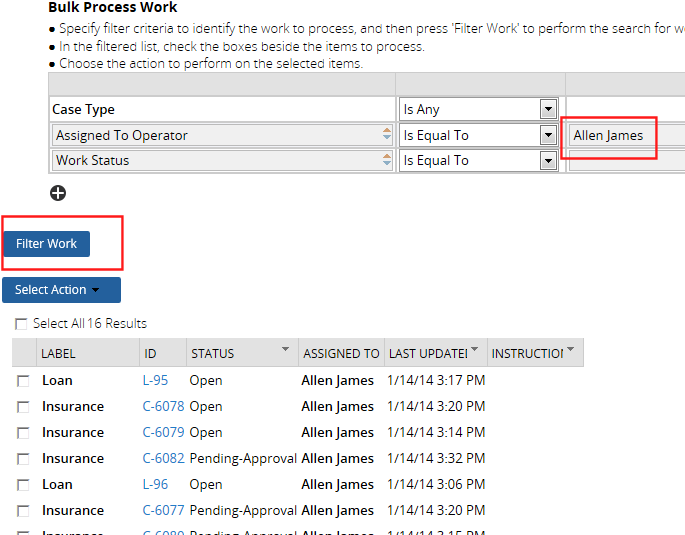 Managers can easily change the default assignment worklist display by removing the Assigned To Operator row and selecting the Filter Work button. Select all 13 cases and select the Transfer case ownership action. Specify herself as the new owner in the Transfer case ownership dialog. After she clicks OK, the list shows that she now owns the cases. As a final step, Nancy transfers the items to Andy Glover, and reduces the urgency values by 10. She selects the Select All 7 Results checkbox. Before continuing, Nancy wants to verify that the items are correctly screened. She clicks the L-95 link on the results list to open its form. As indicated, the item is assigned to Allen James, which has an urgency of 30. 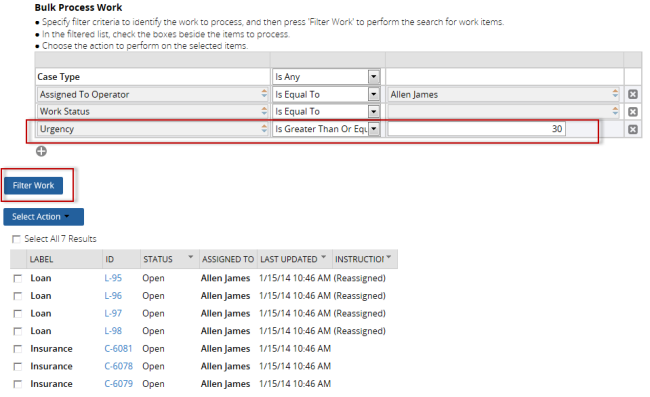 She returns to the Bulk Process tool and selects the Transfer assignment action from the Select Action menu. This opens the Transfer assignment dialog. 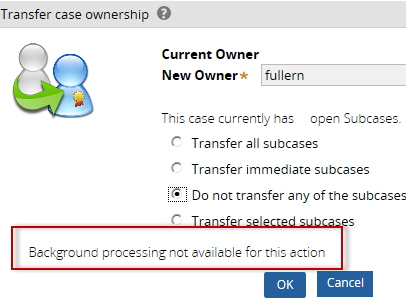 The Transfer assignment local action is always available in this menu; the action does not have to be explicitly configured in cases or processes. Nancy selects Andy Glover from the Transfer to an Operator drop-down list, and clicks the OK button. The dialog closes. 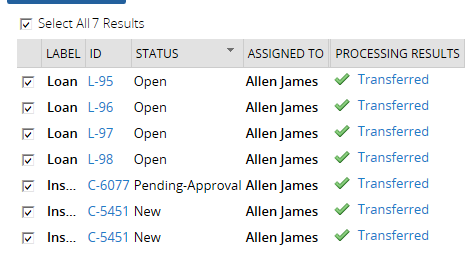 The Processing Results column shows that all of the selected items were successfully transferred. 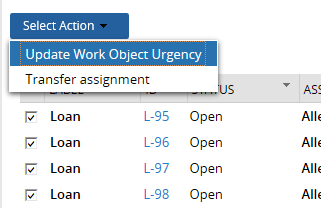 She opens the Select Action menu again and selects Update Work Object Urgency action (this is the UrgencyUpdate local action you added in the Case Designer landing pages). 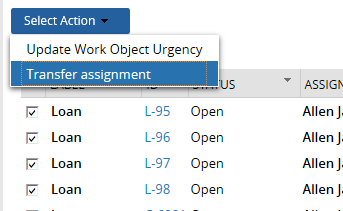 In the Update Work Object Urgency dialog, enter -10 in the Urgency Adjustment field, and click OK. The Processing Results column shows that the action was successful. Remember that the Action menu displays actions that are available to all of the selected items. 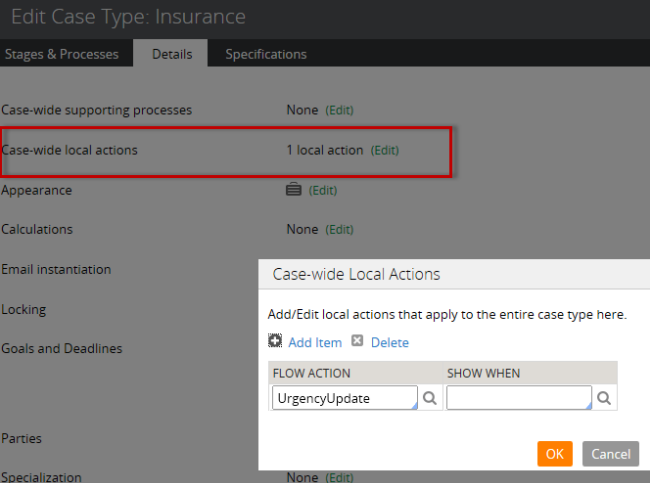 For example, if the Update Work Object Urgency local action were not defined in the Insurance case type, the Action menu would only display the Transfer assignment action. To verify, Nancy opens the L-95 item again. It indicates that it was reassigned to Andy Glover and the urgency value was reduced from 30 to 20. Nancy opens Andy's worklist. It now contains the seven items she transferred. If a manager needs to process hundreds of assignments or cases, it may be preferable to perform this processing in background and be notified with an email message when the processing is complete. 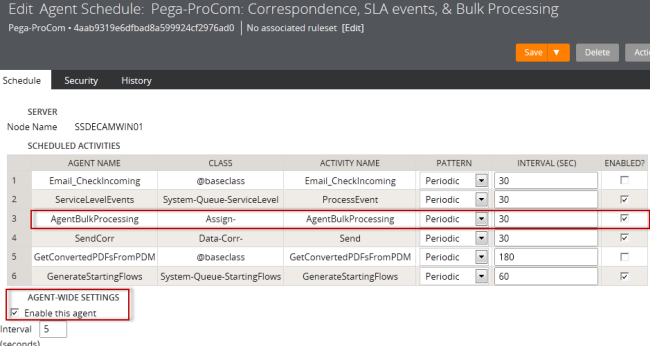 The Pega-ProCom agent includes an activity that provides such processing. Background processing cannot be used with all actions. The action dialogs indicate this by either providing a checkbox that lets you select background processing, or displays a label stating that it cannot be used with the action. 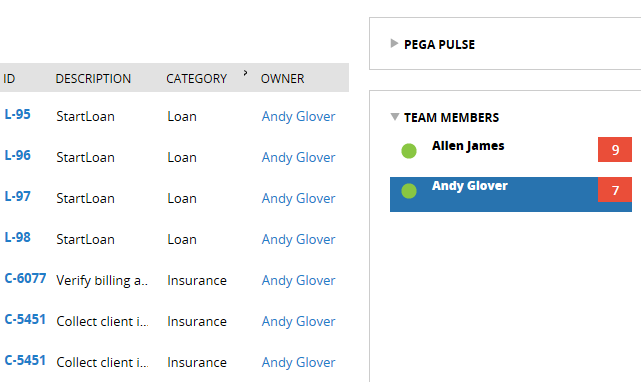 Review the Data-Agent-Queue instances on your system; there is one for the Pega-ProCom agent on each node. Ensure that the row identifying the AgentBulkProcessing activity is enabled on at least one node, and that the Agent-Wide Settings Enable this agent? checkbox is selected for that node. Ensure that an email account data instance (Data-EmailAccount class) is defined to send email from your application. For each manager who is to use this facility, ensure that a valid email address is present in the Operator tab of the Operator ID form. 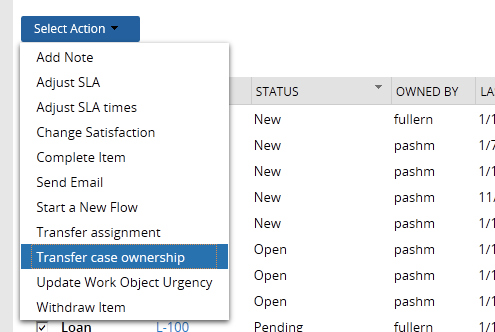 When a manager selects an action from the Actions menu, the action dialog may contain a checkbox labeled Bulk process in background if the process is available for that action as shown in the Adjust SLA times action dialog. If the action cannot be run in the background, the dialog contains a message stating this. For example, the manager cannot background process the Start a New Flow action. The process runs in the background and the manager can go on to other areas of the application. Background processing may take minutes or hours, depending on the number of work items involved.